The Clarion Collection Hotel Borgen in central Örebro is situated in a wonderful 19th century building, within easy reach of all the city's main attractions. Afternoon Sweets and an Evening Meal are included. This is a cash-free hotel. Welcome to the newly opened Clarion Collection Hotel Borgen. The hotel is centrally located in a historic building dating back to the 1800s. Enjoy the city's rich history, great restaurants and excellent shopping opportunities just around the corner. All guests can enjoy our complimentary Afternoon Sweets and Evening Meal every day. The newly opened Clarion Collection Hotel Borgen is beautifully situated by the Svartån River that runs through central Örebro. From here you are close to the city's restaurants, shopping streets and attractions such as Örebro Castle, just 200 metres away. Find out more about Örebro here. Clarion Collection Hotel Borgen is cash-free, which ensures added security for our guests and visitors. More information about this can be found under FAQs. We want to make things easier for you at the Clarion Collection Hotel Borgen. That's why we serve a main course, soup and salad every evening, as well as something sweet in the afternoon. This is always included when you stay with us. Find out more and consult service times under Services. Our Afternoon Tea is served on a three-tier plate, just as it should be. Delectable sweets, freshly baked scones and scrumptious sandwiches. And specially selected teas of course. You could even try our Sparkling Afternoon Tea with a glass of champagne! An afternoon of luxury – what could be better? Our meeting room is ideal for those wanting to arrange smaller conferences in a grand and contemporary setting. The meeting facilities can accommodate up to 12 people. With its stunning façade, towers and Gothic windows, the Clarion Collection Hotel Borgen could easily be mistaken for a fairytale castle. 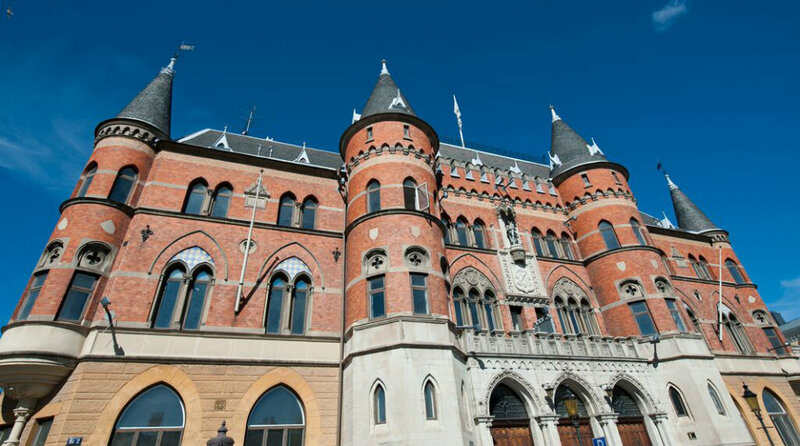 The building was originally constructed in 1891 by architects Fritz Ulrich and Eduard Hallquist, inspired by the Middle Ages. Over the years it has been home to Örebro Sparbank, writer Hjalmar Bergman and the Nerikes Allehanda newspaper, which had its main editorial office in the building from 1934 to 2013. Read more about Borgen's history here. This fantastic building has since been transformed into a modern and stylish hotel. Örebro central station, 300 metres. Public transport to Örebro central station. We recommend Örebro Taxi, phone +46 19 12 43 00 and Taxi Kurir, phone +46 19 12 30 30.